Lemongrass and olives; two ingredients you wouldn’t typically see together. 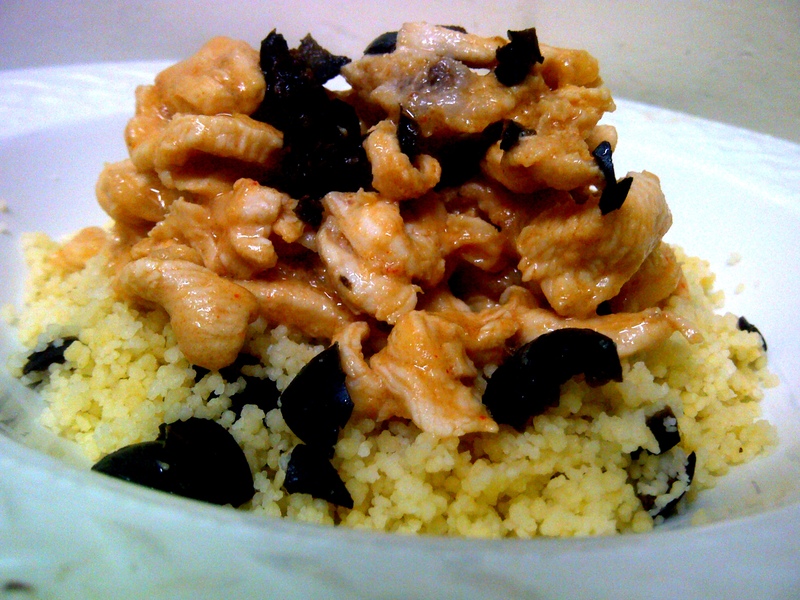 But I was browsing the internets (as usual) and found a lemongrass marinade for chicken, served with olive couscous. My spider senses were tingling… taste of the Orient, and a little bit of Moroccan thrown in, sounds like a party to me! So I tweaked the recipe a little bit, I didn’t want to have to marinate for 2 hours,pan fry, oven-bake the chicken… just thinking about it makes me tired! I haven’t been well you see… so anything that will save me time standing in the kitchen, I will do! Lemongrass, you can usually find the jarred variety in the supermarket, in the Asian section with the green curry pastes and things… But for the fresh lemongrass, a good greengrocer will stock it. Also check Healthy U for dried lemongrass. Couscous is a North African staple food. It is made from semolina. I first tried couscous in a small Moroccan restaurant in Soho (that is in Raaaandaaaan for those of you who don’t know), still remember the name Maison Touareg and I fell in love! It is one of the simplest dishes to make, and for people like me, who for the life of Mary cannot make rice, it is perfect! 4 chicken breasts, sliced (or cubed, whichever you prefer) I sliced mine thinly, Chinese-style. In a large bowl, mix the lemongrass, onions, white wine, olive oil and set aside to marinate while you prepare the couscous. To make the couscous; Place couscous in large, heat-proof bowl. Pour boiling water over couscous, add 1 tbsp olive oil and season with salt and pepper. Stir quickly to blend and immediately cover bowl with cling film, sealing tightly. Leave to steam for about 5minutes, until tender. Fluff couscous with the back of a fork. Add a little olive oil to a large pan, add the chicken, along with the marinade to the pan and cook until chicken is cooked through. About 10minutes. Chop the olives in half, add to the couscous and stir to spread evenly. Serve the chicken over the couscous, sprinkle some olives, just for fun, over the chicken and dig in… well take pictures, then dig in!